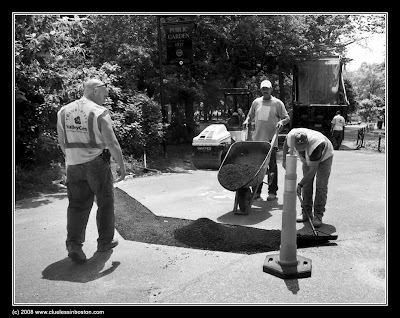 Workers repairing the walking paths in the Public Gardens. This so works in black and white. I see the obligatory supervisor watching the others work. Something just never change. Such a mundane activity, but a wonderful image. It's the b&w and your composition that adds the sparkle. Very impressive photography.